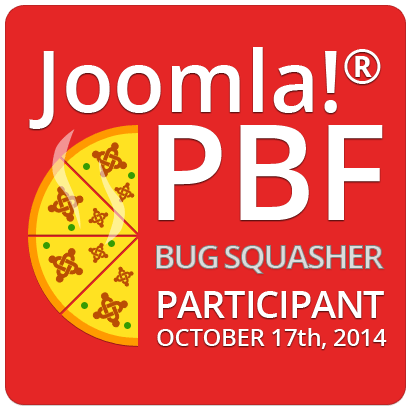 Next Friday October 17th Joomla will be sponsoring their bug squashing event also known as PBF (Pizza, Bugs, and Fun) the event is centered around finding and solving as many potential issues with Joomla 3. There is a tier system based on how many hours you pledge to the event. The first bug Squashing event will be held in the Netherlands and there are more planned so stay tuned. Epic: 100 hours or more pledged to the event. Platinum: 10 hours or more pledged to the event. Bug Squasher: Individuals who are pledging. The first 3 tiers are meant for business’ who are sending in multiple people to find and fix bugs. While Bug Squasher is for any individual who wants to participate. The event requires that you at least know how to install Joomla locally. Even if you have zero coding experience you will be taught during the event how to: find basic errors, reporting, and troubleshooting to help you contribute to the Joomla community. What are you waiting for support the Joomla Community and participate in the Bug Squashing event.